Will a Modi-style clampdown on black money work in Russia? 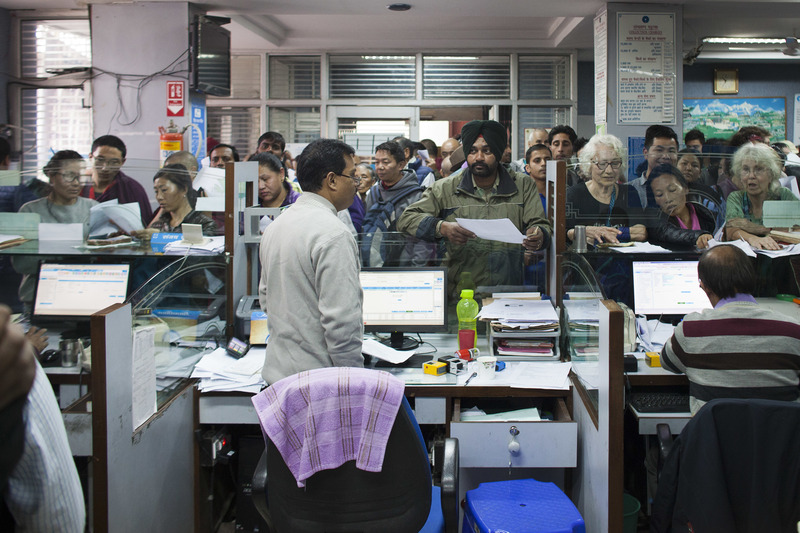 Tourists and Indian citizens wait in a queue to exchange currency notes in an Indian bank. India’s surprise demonetization program is being watched with interest. When the news broke about Indian Prime Minister Narendra Modi’s latest anti-black money measure, Russian visitors to the country were worried about how they’d exchange their Rs. 1000 and Rs. 500 notes. Many tourists buy a large amount of rupees as soon as they land in India. Even a member of the diplomatic corps called me and told me that he was worried about the measure, as he didn’t have an Indian bank account. After I calmed him down and told him that he could exchange the money in a bank in a couple of days, we talked about the potential merits of a similar initiative in Russia. For starters, Russians are a lot more hardened to financial instability than Indians. People, who saw their entire savings wiped out within days when the USSR collapsed, have found better ways to hedge against a future problem. Many of my friends convert their money into dollars or euros. This became an even more popular option after the ruble began its slide in 2014. When the ruble touched 85 to the dollar in February 2016, a close friend of mine converted all his savings into the U.S. currency. It turned out to be a short sighted decision as the ruble appreciated over the next couple of months and has been stable around the 64 mark for a few weeks. Demonetization of 5000 and 1000 ruble notes would not target those with illicit wealth in Russia, since the corrupt also stash away their cash in hard currency. In fact, from the experiences of my friends and acquaintances, I hear the bribe requirements in the country are almost always quoted in dollars. When an Indian friend, who managed an Indian restaurant in Sakhalin, lost his liquor license in 2006, he was told by some acquaintances that he could get his license back in a day if he paid $2000. The young man decided to not pay up and went via the regular route and managed to get his license back in about 6 weeks. I’ve personally not had to pay a bribe anytime in Russia but I do use the services of agencies when I need things done. I can be pretty sure that these agencies do shell out some cash to someone from their charges. While the agencies and their charges are perfectly legal, the money they pay to some petty bureaucrat isn’t. But given the bureaucracy in Russia, sometimes it’s better for a foreigner to hire the services of these agencies. Coming back to the idea of demonetization, as long as it’s this easy to hold dollars and euros in Russia, the only people who would be affected by such a measure would be the common folk. It’s impossible to demonetize hard currency, but maybe Indian-style restrictions on holding foreign currency could be of use in Russia. For over a decade, I have travelled in and out of Russia without customs officers asking me anything, but there has been a visible difference over the last year. Now, customs officers in Moscow question travellers about how much Russian and foreign currency they’re taking out. However, the small amounts taken out by travelers don’t really impact Russia. Western bankers and accountants are skilled enough to help the most corrupt in Russia take their ill-gotten wealth abroad. London and other European capitals have a small community of Russians who live it up (and have residency) thanks to the amount of money they have managed to bring across. The holier-than-thou British government tends to look the other way when dirty money is laundered in London, which is probably the world’s biggest washing machine for black money. In 2013, the Russian government banned civil servants from engaging in activities that were funded by foreign or international organizations. This was followed up a law that banned government officials from owning property and operating bank accounts abroad. The law made it mandatory for officials to declare the assets of family members abroad. Russia’s anti-corruption drive even led to the sacking of a defense minister. Corruption is a problem that is ever-too common in both Russia and India. As ordinary citizens, most of us still feel powerless to tackle the problem, but there is definitely a light at the end of this tunnel. Since the modus operandi of white-collar criminals is different in both countries, there isn’t really a common strategy that can be applied in tackling the problem. However, India, along with Russia, have been at the forefront of using the G20 as a mechanism to catch global tax cheats, the really big fish who have taken their billions to the safe offshore destinations. The diplomat with whom I had the discussion on anti-corruption measures suggested that India and Russia could share and learn from their experiences in this area. We agreed that tough laws needed to be followed up with tough enforcement if our societies were to be free of this cancer. Meanwhile we’ll see how much India benefits from this demonetization initiative! Economic crisis rolls corruption back in Russia?